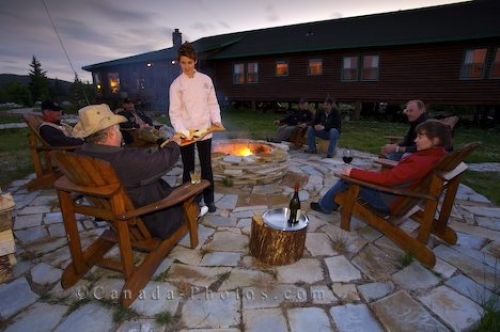 As guests at the Rifflin'Hitch Lodge in Southern Labrador, Canada chat around the outdoor fire pit, the gourmet chef brings around appetizers. Fire pits are a great place to whilst away the hours and share fishing stories, especially at the Rifflin Hitch Lodge during the early evening hours. Chef serving people gathered around the Fire pit, Rifflin'Hitch Lodge, Eagle River, Southern Labrador, Labrador, Newfoundland Labrador, Canada. Picture of people enjoying the simple life of outdoor fire pits at the Rifflin'Hitch Lodge in Southern Labrador, Canada.